A hugely flexible theme built on a neat jQuery layout plugin that arranges your posts vertically than horizontally with complete control over the number of columns on the home and archive page. 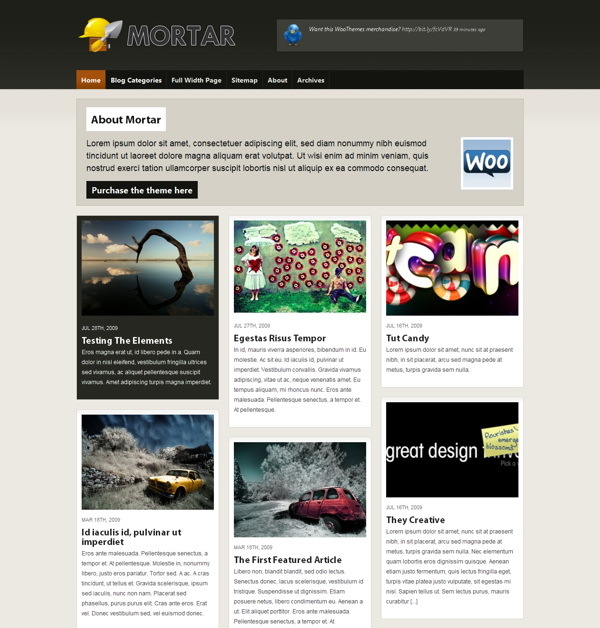 Ideal for magazine, portfolio and gallery based websites. Built on the popular JQuery layout plugin Masonry, the home page arranges blog posts vertically then horizontally to make sure there is a neat grid of posts with no spacious gaps between them. The home page and archive page also have the option to arrange the posts in 1, 2, 3, or 4 columns giving you complete flexibility with your layout. There is a completely widgetized sidebar with 2 custom widgets included in the theme packaging. No third party widgets required and 8 amazing color schemes to choose from. Making simple changes without editing code, like adding your own logo, changing to an alternate color style, adding Google Analytics code, couldn’t be easier with the back-end theme options panel. The theme is compatible with all the modern web browsers like Firefox, Safari, Chrome and Internet Explorer. There is an image resizer script built into the theme framework to automatically scales your post images for pixel perfect display in our templates. No need to upload new cropped images when re-designing your website. It comes packaged with a .po file for easy WordPress theme translations into your desired language – editing one neat little file without hunting down text in the theme templates.